How does financial inclusion impact climate change? Climate change and environmental risks are of growing concern for central banks, financial regulators, and ministries of finance from developing and emerging countries whose policy mandate covers 85 percent (or approximately 1.7 billion of the world’s unbanked). Of these, over 200 million people are currently affected by environmental disasters globally, costing world economy hundreds of billion annually and displacing thousands of people every day. Developing and emerging countries feel the effects of climate change the most; climate change increases financial exclusion, and is among the greatest barriers to financial stability and poverty alleviation. Financial policymakers and regulators in the AFI network are central to ensuring financial stability in their countries. They recognize the dual threats of financial exclusion and climate change as key barriers to financial stability. Policymakers also recognize that financial inclusion is vital in helping the most vulnerable communities build resilience and mitigate losses that are caused by climate change. 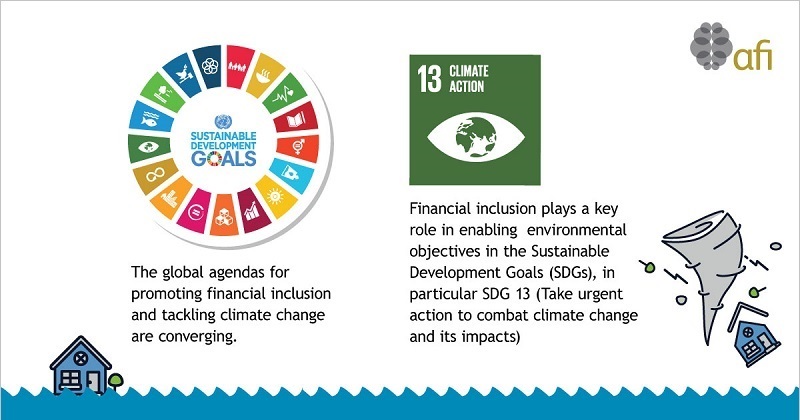 As such, they collectively acknowledge that financial inclusion plays a key role in enabling environmental objectives of SDG 13 (Take urgent action to combat climate change and its impacts). To that end, AFI members in Bangladesh, Brazil, China, India, Morocco, Fiji and other countries have made efforts to align financial inclusion initiatives with environmental policies. Between 2015 - 2017, an increasing number of AFI members voiced interest in scaling up peer learning on ways to develop and implement financial inclusion policies that also have positive environmental outcomes. This momentum culminated in September 2017 with the launch of the Sharm El Sheikh Accord on Financial Inclusion, Climate Change and Green Finance, endorsed by an overwhelming 94 percent of the AFI membership. The Accord commits AFI members to work together and with partners to identify, understand and implement financial inclusion policy solutions that also have positive outcomes for the environment, focusing on communities that are most vulnerable to climate change. SDG 13 (Take urgent action to combat climate change and its impacts) cannot be fully realized without strong support and systematic engagement with financial policymakers and regulators in developing and emerging countries. The Sharm El Sheikh Accord complements existing efforts of the global development community by ensuring that support and engagement. 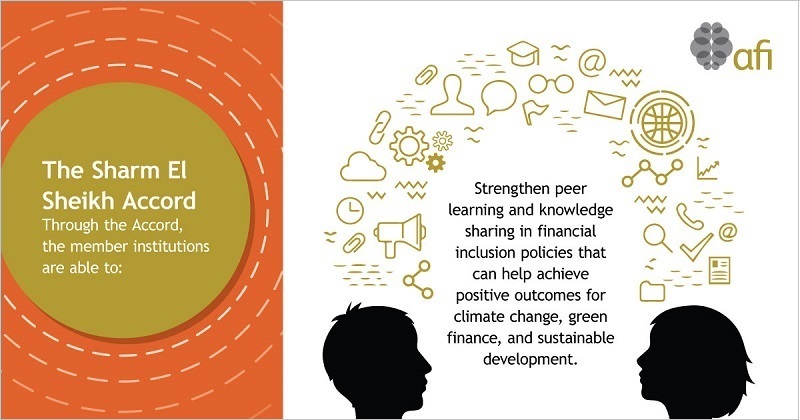 AFI is uniquely placed to incite policymakers and regulators in its network who have prioritized financial inclusion, to also pursue innovative and complementary policy solutions that facilitate climate-friendly outcomes. Read also: After Paris: How can financial regulators play a role in combating climate change? The Sharm El Sheikh Accord will enable well-informed policy implementation via AFI’s truly collaborative bottom-up approach, which increases the likelihood of the sustainability of policy reforms. When the Paris Agreement came into force, 85 out of the 175 signatories were countries with AFI member institutions. Given the strong endorsement of the Sharm El Sheikh Accord by 94 percent of AFI’s voting membership, the political support among developing and emerging countries to advance financial inclusion and climate change is unprecedented. Up to 50 countries are expected to engage on this topic together, leading to significant policy innovation. Developed countries including France, Germany, Canada and Sweden have already initiated dialogue with AFI on ways to support the implementation of the Sharm El Sheikh Accord. On 27 November, 2018, AFI members concluded the first international green financial inclusion conference by agreeing on the Nadi Action Agenda — outlining specific measures AFI members can take to address financial inclusion and climate change challenges, and how best to use AFI's capacities for generating knowledge, information exchange and peer learning. View the Nadi Action Agenda. The Nadi Action Agenda also recommends that green financial inclusion is incorporated into a range of AFI activities and events, in addition to developing knowledge to measure the impact of green financial inclusion agenda. The Agenda advises the collaboration and coordination with relevant private sector players and the international development community, but also highlights the importance of the Maya Declaration in focusing on national efforts in green financial inclusion. Finally, the Agenda would be shared with relevant global leaderships to raise awareness on green financial inclusion by AFI member institutions.